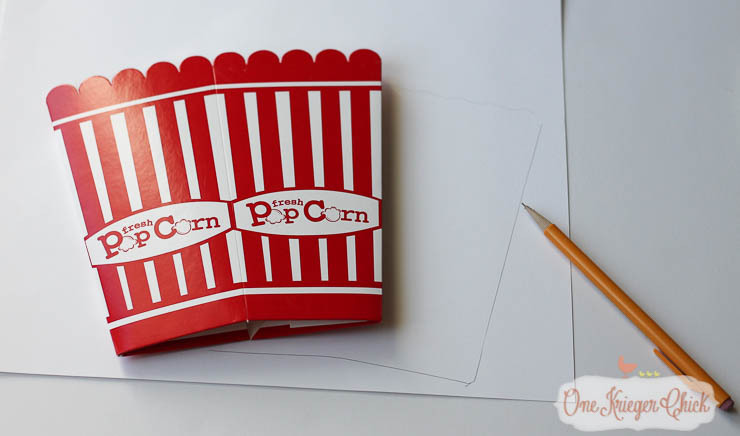 I’m participating in a super fun Popcorn Box Blog Hop with a bunch of other bloggers. 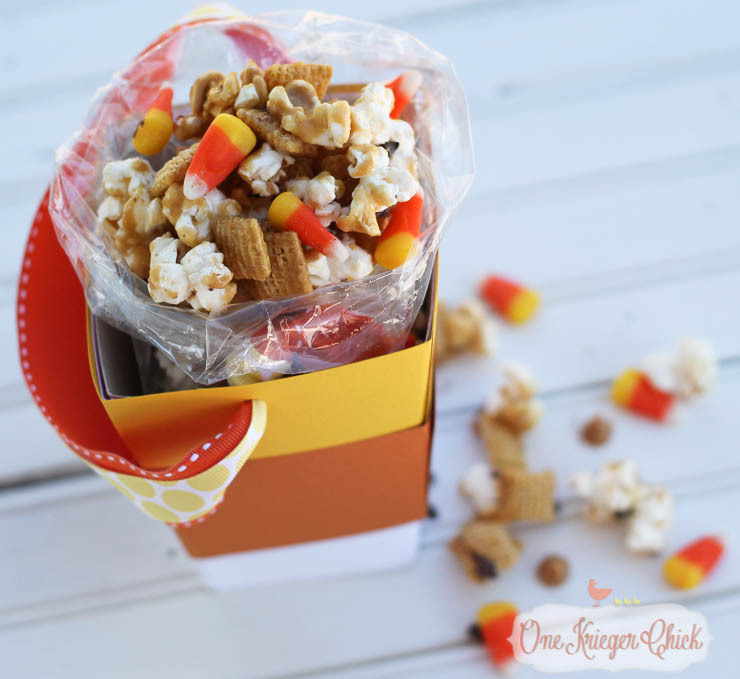 We were all given a plain popcorn box to transform with a Halloween theme…After you read all about mine, be sure to visit the others showcased at the end of the post. There may even be an Awesome giveaway! 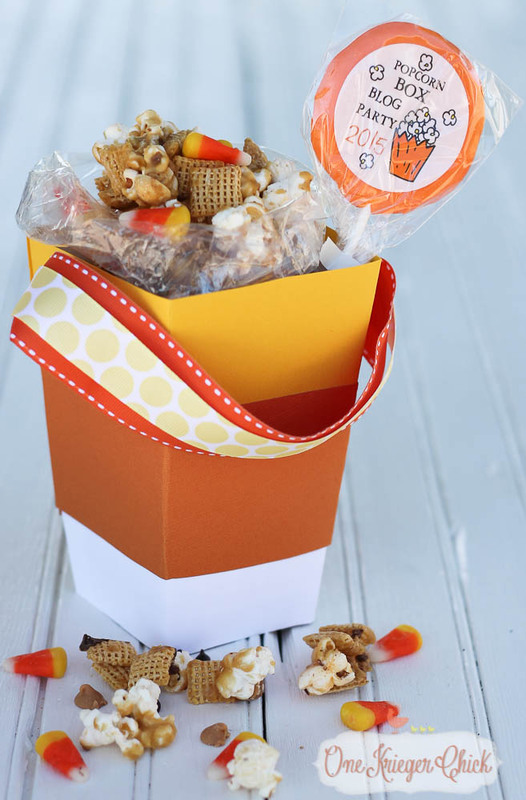 One of my favorite candies this time of year is candy corn, so I transformed my box into a Candy Corn Treat Box full of a yummy Caramel Popcorn Party Mix. First, I’ll share how I made the box…then, the recipe. It’s worth the wait! 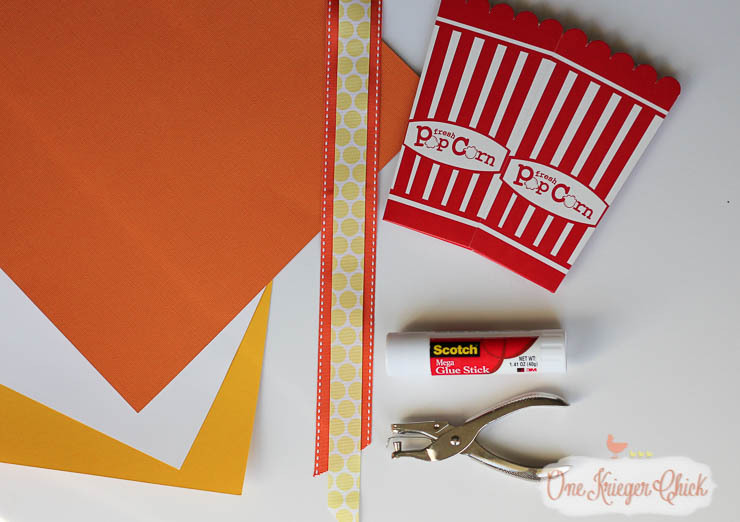 You’ll need the following supplies: Popcorn Box, Cardstock paper in white (2 sheets), yellow, and orange, orange and/or yellow ribbon, adhesive, hole punch, and scissors. 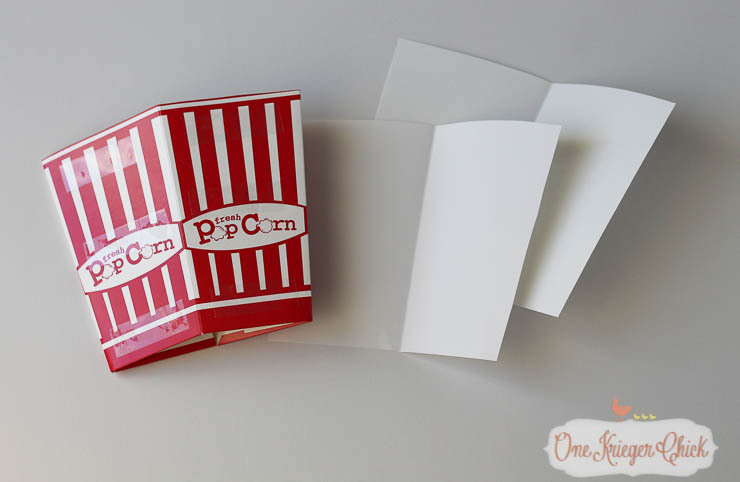 Cover the box with white cardstock. 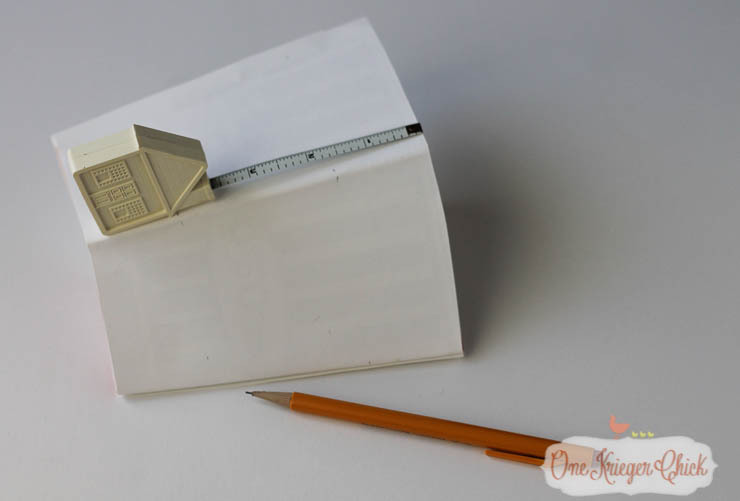 Use a pencil to trace the box onto cardstock. Two sides fit on one sheet of paper. I left the sides a little wider than the traced lines to have a tab to adhere the pieces together. I should have cut the scalloped edge off of the box before tracing the white, but I didn’t think about it at the time. You can choose to leave it on or off…I’m not sure it makes any difference. 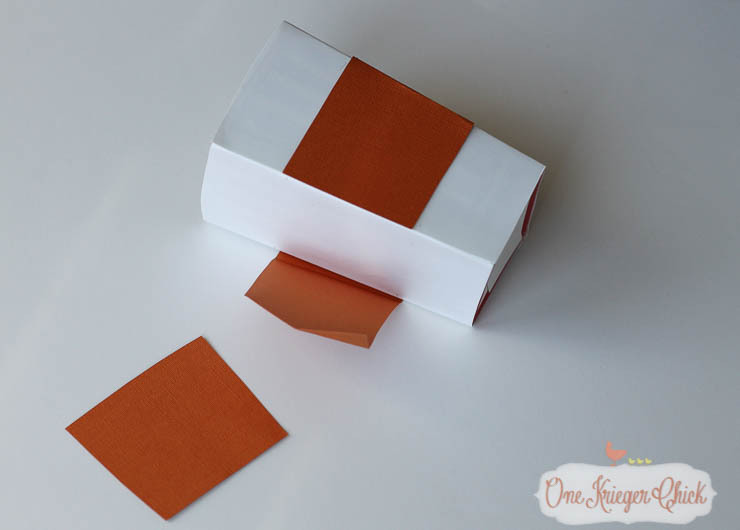 Use double sided tape to adhere the white paper to the box. There should be a little overhang on each side. Tuck it under the edge of the other paper. 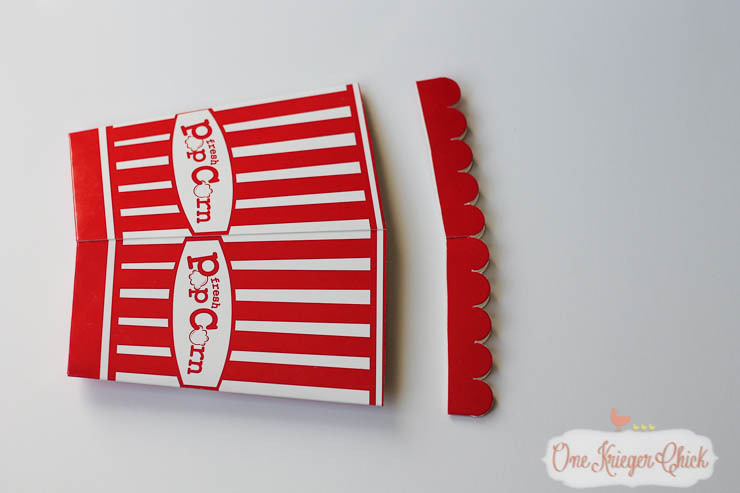 This will keep the popcorn box from showing through the edge. Measure and mark the same length on each side for the yellow and orange stripes. 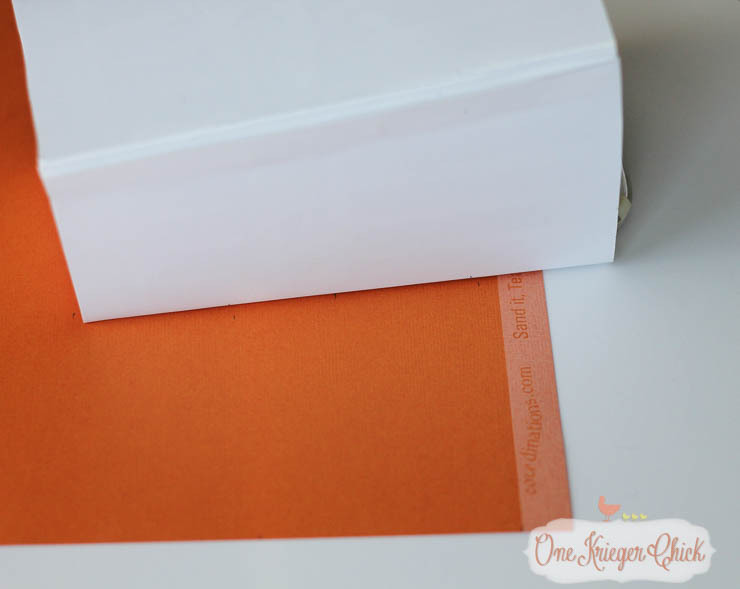 Line up the marks on the white paper to marks on the orange paper. It will not be a straight line, but will curve slightly to the left as the box is rolled and marked on each side. Adhere the orange paper around the middle of the box. A 12×12 sheet of paper is not large enough to cover all four sides of the box, so cut a separate piece for the fourth side. 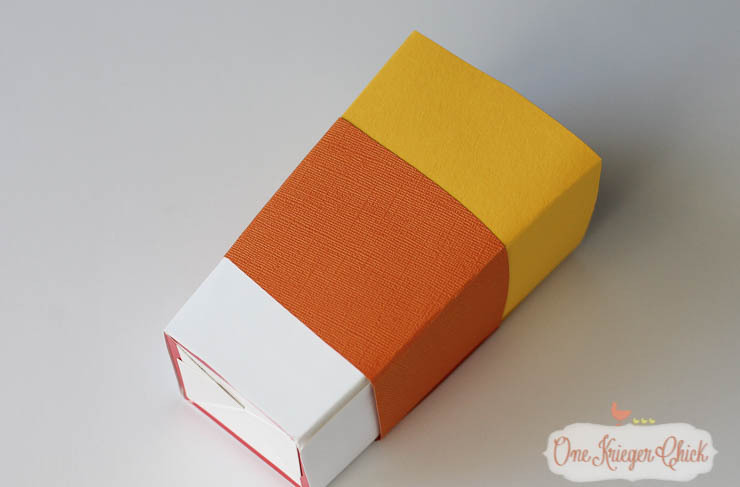 Measure, cut and adhere the yellow cardstock just like the orange until it looks like this. I did not cover the bottom of the box, but you certainly could. 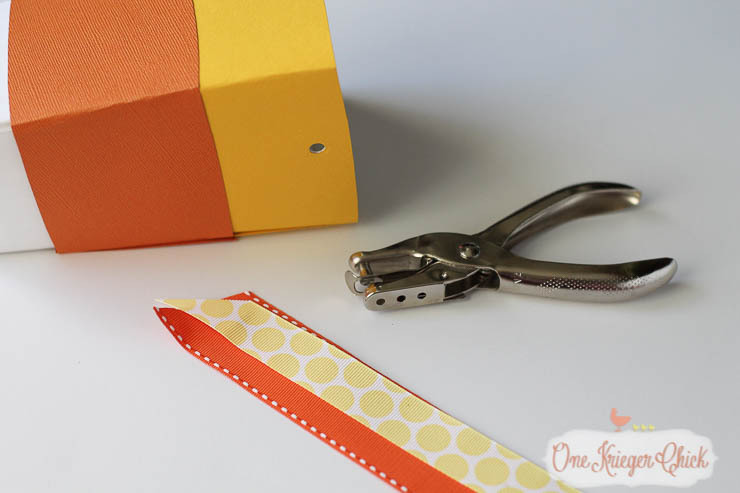 Use a hole punch to punch a hole in opposite sides of the box. 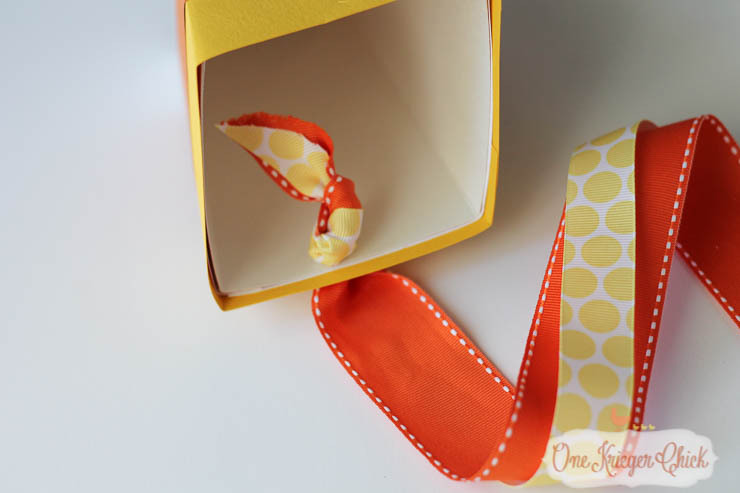 Pull the ribbon(s) through each hole and tie a knot. 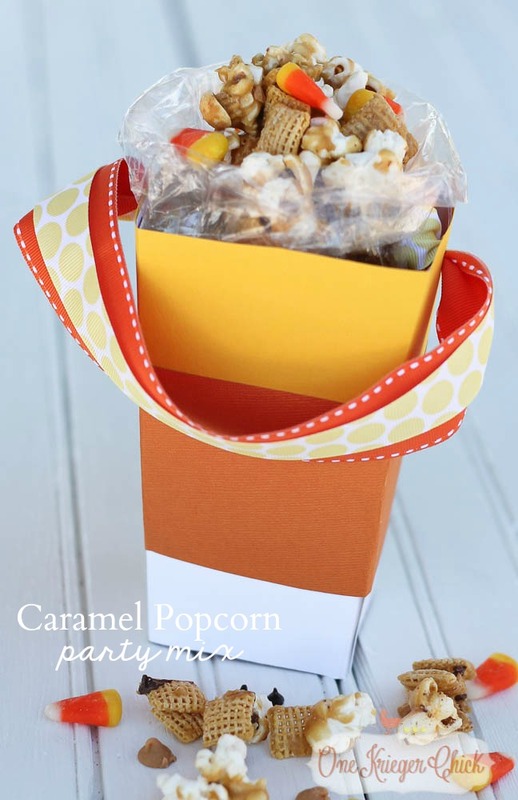 A caramel, crunchy popcorn party mix perfect for fall. Can be customized to specific tastes. Spray large baking pan with cooking spray. Mix popcorn, cereal, peanuts and pretzels (optional) in a large bowl. Combine brown sugar, butter, and corn syrup in a saucepan. Once it comes to a boil, allow it to boil for 5 minutes without stirring. Pour over dry mixture and stir to coat. Bake 45 minutes, stirring every 15 minutes. Transfer to a bowl and stir in candies and chocolate mix-ins. This can be made to suit your taste. Add in whatever mix-ins you like...They all taste delicious! Oh, and did I mention there’s a giveaway too?! Best of luck, Friends!